Any meditator knows the function a meditation pillow serves. Meditation pillows, or zafus, are essential tools used in meditation practice. These meditation cushions assist the meditator in performing the various meditation posture meditation teaches. Whether they’re experienced or novice mediators, these pillows make the perfect gift for your loved ones. Here’s a basic guide to everything you need to know about how to make a zafu meditation cushion. Why Should You Make a DIY Meditation Pillow? “It is inner stillness that will save the world” – Eckhart Tolle 曆 We take in so much information everyday that our bodies can have a hard time keeping up and processing! Stillness, quiet time, ease and meditation is considered medicine in today’s fast pace world . Take a moment or two or three to Sit Breathe and Relax. The universe needs your magic . Meditation pillows or zafus serve as a meditator partner during their zafu yoga practice. They’re often used as a seat when performing different positions like sitting cross-legged or when on your knees. It can also be used to protect your hips or simply performing a sitting meditation whether on the floor or on a meditation bench. While they’re very functional, these pillows also cost a lot. In fact, most zafus cost more than $40. You can save money by making your yoga meditation cushion to give to your loved one. 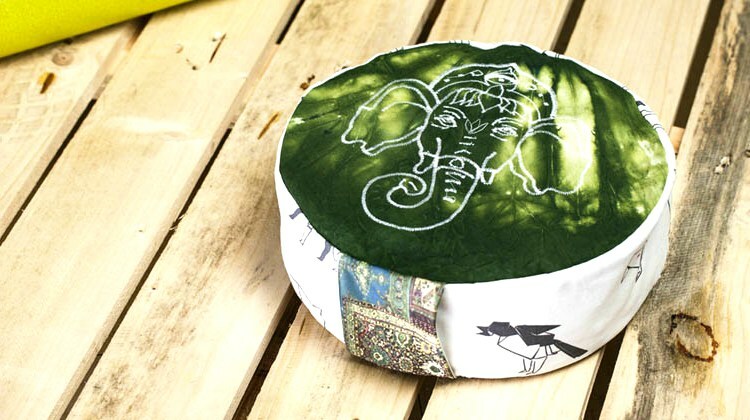 A zafu meditation pillow will be heavily used by the meditator during their sessions. Giving them a customized and handmade pillow may provide your loved one with a sense of familiarity. The person you give the zafu pillow to may remember you every time they use the pillow. Also, you can make meditation cushions zafu that perfectly suits their needs, characteristics, and traits. Green– Helps the meditator to calm down. This color creates a serene and calm environment for the user. Red– This color is associated with fire. It helps the meditator achieve increased energy levels. Yellow– It’s a happy color that clears your mind. Violet– A color that helps the meditator restore balance to their life. This is ideal for people who meditate with the purpose of organizing their disoriented thoughts. Blue– Similar to green, blue helps the meditator to relax and meditate peacefully. It also creates a calm and relaxed environment. Orange– It is an energizing color that helps heal the meditator both mentally and physically. Black– It is a serious color that helps meditators focus and practice discipline. People often stuff meditation pillows with either Buckwheat Hull or Kapok Fiber. The fillings depend on what the meditator needs. If they want a durable and stable meditation pillow, then you can go for Buckwheat Hulls. You can choose to use organic buckwheat hulls too. They are dense materials that provide a firm seating for the meditator.You can opt to use Kapok Fiber if the meditator wants lighter and fluffier material. Nonetheless, both these elements create a meditation pillow that will not easily give in and take the shape of the meditator’s buttocks. When making the meditation pillow, consider the meditator’s height, flexibility, and reach, among others. Variations of these pillows include round-cushioned and rectangular-shaped cushions. Since you’ll be making your pillow, you can adjust the height and length according to the measurements of your loved one. A zafu cushion is supposed to assist a meditator during meditation sessions as much as possible. The best meditation cushion is one that matches their needs, traits, measurements, and characteristics. Determine what your loved one truly needs and you’re sure to create a meditation pillow that will suit them. Have you tried making a zabuton meditation cushion too? Feel free to share your thoughts with us in the comments section below! Editor’s Note – This post was originally published on December 12, 2017, and has been updated for quality and relevancy.